This post is visible only to friends of the author. You must be logged in, and listed as a friend to view. It’s my 10th anniversary as a bookcrosser today. Strange to think I’ve been doing it for so long, although given how much I’ve done over the past 10 years (travelling all around the world, organising conventions, meeting all sorts of weird and wonderful people) 10 years doesn’t actually seem long enough to fit it all in. Or rather, vote for my team, who have been nominated in the 2012 Digital Humanities Awards http://DHawards.org/DHawards2012/voting. We’ve been nominated in the “Best DH project for public audiences” category, for our CEISMIC digital archive. Actually, I don’t think I’ve ever mentioned CEISMIC on here, have I? That’s where I’ve been working for the last couple of years, helping build a massive archive of material related to the Christchurch earthquakes – we’re trying to collect everything from people’s stories to government soil reports to news footage to historic images of demolished buildings to the tweets people sent. It’s a fantastic job, building something that will be of immense value to future researchers, and really fascinating work, although sometimes it’s a bit depressing when I have to spend my days immersed in images of destruction – a bit hard to move on from memories of the earthquakes when you’re surrounded by them all day! 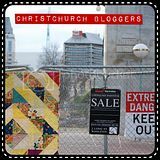 Anyway, check out http://www.ceismic.org.nz and https://quakestudies.canterbury.ac.nz to see what we’ve been up to (QuakeStudies is the research arm of CEISMIC, and the area I spend most of my time working on). The phantom marmite deliverer was Rarsberry. Thanks! A mysterious gift of marmite just appeared in our hallway (at least, I assume it just arrived – I’m pretty certain it wasn’t there last time I walked past). Neither of us heard it arrive, but it’s a lovely day so the front door is wide open, so whoever it was obviously just popped it inside in without knocking. 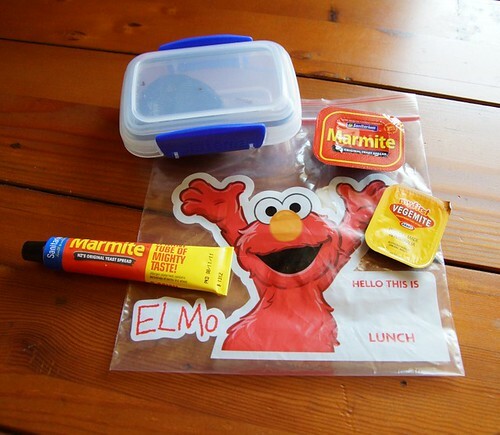 I’ve got no idea who was the mysterious donor (I’ve complained to a *lot* of people about the marmite drought), but the Elmo lunch bag narrows it down a bit. MrPloppy reckons it was Tam, who would be likely to just drop it and run without announcing her presence, but Rarsberry also mentioned a while back that she had some unwanted marmite lurking in her cupboard, so maybe it was her. Anyway, whoever it was, if you’re reading this, thank you!